From Bio Cycle May 2017. “The City of Surrey, British Columbia will be opening its 127,000 tons/year food waste and yard trimmings organics recycling operation in June. After eight years of planning and construction, Surrey, British Columbia is set to open an anaerobic digestion facility that will convert up to 127,000 tons of food waste and yard trimmings each year into renewable natural gas and high quality compost. Orgaworld Canada Ltd. partnered with the City of Surrey to build the $67.6 million (Cdn) Surrey Biofuel Facility, with funding help from the Canadian government. Orgaworld describes the facility, to open in June, as the largest of its kind in North America. It also supports a goal of the Canadian Gas Association — which represents Canada’s natural gas distributors — to have five percent renewable natural gas (RNG), from both anaerobic digestion and gasification of forestry and agricultural wastes, in the national pipeline distribution system by 2025 and 10 percent by 2030. The City of Surrey provided the land for the project — a 6.6-acre site near its transfer station — and will own the facility. A subsidiary of Orgaworld Canada, Orgaworld Surrey Ltd., designed and built the plant, and will operate it under a 25-year contract. Under a “put or pay” deal, the City guarantees to deliver at least 64,000 tons of feedstock annually from Surrey’s 102,000 homes, and Orgaworld guarantees production of a minimum 100,000 gigajoules of RNG. However, the City expects to initially provide 71,500 tons of residential organics, and forecasts that, with continuing population growth, the amount will rise to as much as 99,000 tons by the end of the contract period. To reach the plant’s full capacity, Orgaworld is responsible for acquiring feedstock from the industrial, commercial and institutional sectors as well as residential sources throughout the Vancouver region. As the City’s share increases, those outside sources will decline. Each year, the project is expected to produce 120,000 gigajoules of RNG, upgraded from the digester biogas using equipment supplied by Greenlane Biogas. 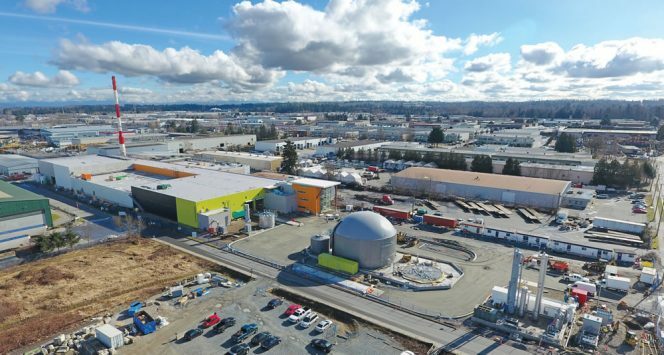 That’s enough to fuel 42 city waste trucks as well as 60 maintenance vehicles, and also to partially supply Surrey’s new District Energy Centre, a centralized system intended to heat and cool buildings in the city center using a variety of energy sources. However, these end users will not be fueled directly with RNG from the facility. Instead, the gas will be sold to FortisBC, the provincial gas distributor, and the city will buy back an equivalent amount of gas deemed to be RNG. The selling and buy-back prices will be the same, meaning this part of the project will have no financial impact on the City budget. Digestate from the process will be treated aerobically to produce up to 44,000 tons of compost annually that will be sold on the wholesale market for use in agriculture and landscaping. No details of specific markets are yet available. The project is partially funded by the Canadian government, under its national plan to create public-private partnerships, or P3s, to repair and build major infrastructure through collaboration with the private sector. In this case, the government is funding 25 percent of the cost, while Orgaworld covers the remaining 75 percent. Orgaworld will earn income from tipping fees and compost sales.